When it comes to evicting tenants, landlords would be best served by having a process server handle the delivery of the eviction notice. The three-day eviction notice gives the tenant a warning that they must either pay past due rent owed or vacate the premises. Three-day eviction notices can also be served in situations where the landlord deems the tenant to be a nuisance due to agreement violations. If the tenant does not pay or vacate within the three-day notice, the landlord can then continue with court proceedings to formally evict the tenant. Improperly providing this notice can work to the benefit of the tenant and jeopardize the landlord’s attempt to evict the tenant. Each state has its own rules regarding the eviction process, and it is important that these rules are followed. Although in most states any person over the age of 18 is capable of serving the three-day eviction notice to the tenant, there are a number of reasons why a process server can provide extra benefits that may not seem overtly apparent. Keep reading to learn more. 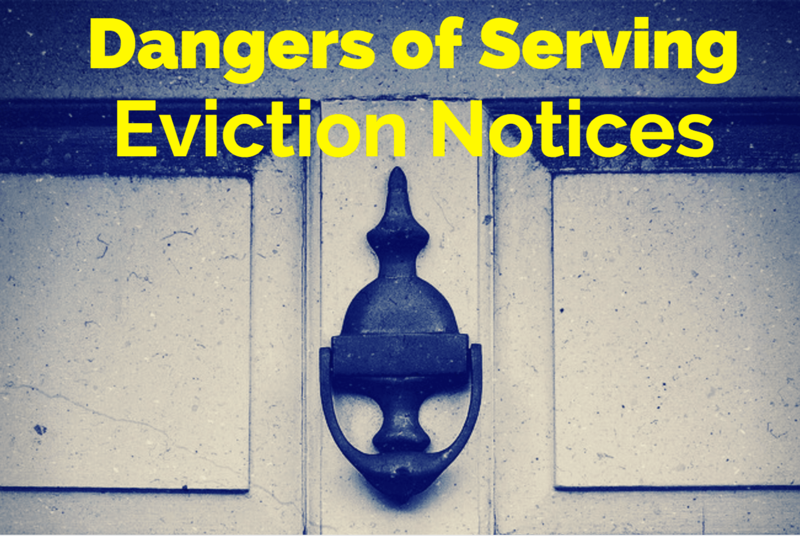 The success of your eviction depends heavily on the tenant being properly served. Process servers are trained in how to serve process effectively and efficiently. Although process servers will charge a nominal fee to handle serving process, getting it done right the first time can save thousands in legal fees. For example, if the tenant hires a lawyer and finds that the notice was served improperly, the landlord could be responsible for attorney fees and may even lose the property, which is what happened in Palm Property Investments, LLC v. Yadegar (2011). That case resulted in a lengthy court process that took years to resolve, along with a judgment of nearly $180,000 in attorney fees, which the landlord had to pay. Overall, choosing to pay a process server to serve a 3-day eviction notice can eliminate the unnecessary risk of having to shell out extra money if the tenant decides to fight the eviction in court. Additionally, experienced process servers are usually well versed in their state’s laws, whereas a non-professional individual chosen to serve process may not know the nuances of the law. Landlords may find themselves in a situation where the non-professional individual could jeopardize the efficacy of the service if the person serving did not follow the state’s guidelines for serving eviction notices. An example of such a violation could be if the non-professional process server did not follow the state’s prescribed rules for where it is acceptable to serve the 3-day notice. The person could have simply dropped the service at the tenant’s place of work thinking that he or she was notified properly. If this were to happen in Florida, the service could be deemed improper due to the state statutes, which state: “The delivery of the written notices required by subsections (1), (2), and (3) shall be by mailing or delivery of a true copy thereof or, if the tenant is absent from the premises, by leaving a copy thereof at the residence. The notice requirements of subsections (1), (2), and (3) may not be waived in the lease.” Additionally, the statue has strict guidelines for the language of the notice. Professional process servers who have chosen the field as their profession or livelihood are often members of professional process server associations, which keep process servers informed of changes in legislation. They also offer continuing education classes to keep process servers up to speed with any changes in the profession. Process servers will also provide extra proof that will show when and how your tenant was served by providing a notarized Affidavit of Service. Having proof of service is imperative in court proceedings as it avoids a conflict over whether or not the service was effectuated properly. The service affidavit will show how the service was performed, when it occurred (including the time and date of service), and where it occurred. The process server will sign the Affidavit of Service that can be used as evidence in court. Some process servers even have GPS technology that gives a date and time stamp along with GPS coordinates showing exactly when and where the service occurred. Others may also include pictures of the service or even video. Typically, a non-professional individual would not know to do this or have access to these additional resources. When a landlord needs to get a 3-day eviction notice served, using a process server can provide not only peace of mind but also proof that service occurred. That is why it is best to choose a professional process server when faced with having to evict a tenant. If you are a landlord looking for a process server to give a 3-Day Eviction notice, search our directory to find a professional in your area.